(TORONTO, ON) With reports that employees at various Tim Hortons franchises in Ontario have been informed that they will no longer receive paid breaks and health benefits because of the January 1 increase to a $14.00 minimum wage, the Ontario Federation of Labour is sending a message to those owners: an affront to one worker is an attack on all working people. “Workers in Ontario are disgusted by the actions of these employers,” said President of the Ontario Federation of Labour Chris Buckley. “It’s shameful that a company like Tim Hortons, which trumpets its Canadian values, would stoop this low. This spiteful action toward their own workforce only goes to show working people, including their customers, the level of greed at which they operate. My advice to their employees is to join a union and fight for better rights in the workplace,” said Buckley. 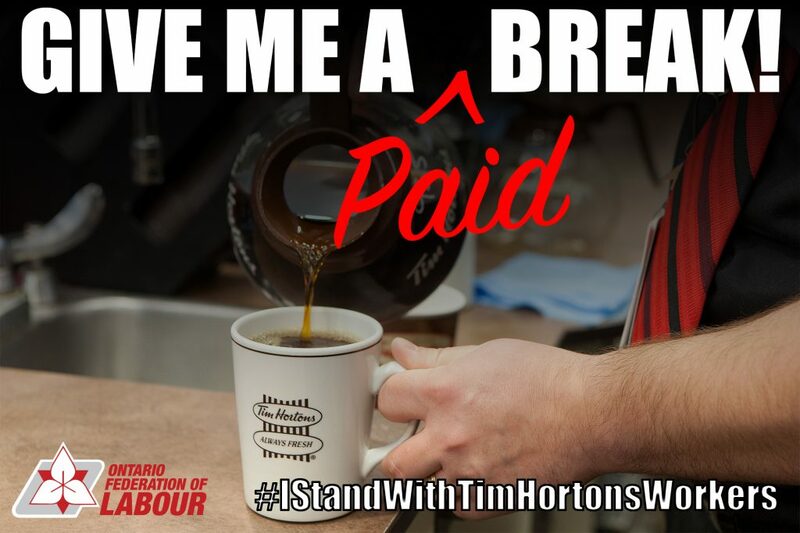 The Ontario Federation of Labour is encouraging its one million members to support these workers and call on Tim Hortons to reinstate paid breaks, using the hashtag #Istandwithtimhortonsworkers. “Forget your double-double, the labour movement will double down against these bully employers set on attacking their vulnerable minimum wage earners”, said Buckley. “The action of these Tim Hortons franchise owners has got the attention of our entire movement, and the many millions of decent Ontarians that frequent their establishments every day,” said Chris Buckley. “Workers across this province recognize that employers are using the rise in the minimum wage to reduce the quality of work in this province, and the Ontario Federation of Labour will take action to maintain decent work for all,” he added.